Home › christianity › Are You Really Free? Today is the 4th of July. It’s the day Americans celebrate their independence from England. It all started when the pilgrims were seeking freedom from the tyranny of the church. They wanted to worship God they way they believed, and not be dictated to by a political entity. You see, at that time the church had entertwined itself into the government and created such fear that even Kings were afraid of the church leaders. The pilgrims gave up everything and risked their lives for this freedom! Many years later our forefathers were being taxed, but not represented. Control was being exerted once again, but this time by a king. Once again, risk was required. To gain the freedom they desired they had to risk losing everything, even their own lives and the lives of their family. The last few generations don’t know what true freedom is. We have been lulled into believing that freedom means having the things of this world and living a comfortable life. This is simple not true. Freedom is the ability to overcome fear and risk everything in order to gain what was lost or what has never been had. What is ironic is that entitlement and indulgence in the things of this world is what is allowing others to control us. It is the fear of losing the attachments we have to this world that is now enabling us to become enslaved to the world. The true irony is that you are always going to be a slave, but you have a choice. Are you going to be a slave to this world, or are you going to become the willing servant of Jesus Christ? The world will tell you that church is just trying to control you. They may be right. Let’s face it, historically people in power (even within the church) have been doing it since the early days of Christianity. But here’s the good news: Being a Christian is about freedom! Being a Servant of Jesus empowers you, and Jesus empowers you to be you! The best you! The freedom to be yourself? Now that’s freedom! What’s even better is that by negating of ourselves, our willingness to endure hardship faithfully and following Jesus also brings sonship. We become children of The Living God! God gave you all those talents and abilities, and He wants you to use them to the fullest! He also wants to add to them! Not for your selfish ambitions, but for the betterment of others and for His kingdom. Just as good fathers want to give their children amazing things, God desires to do that for us. When you fully abnigate yourself and become a willing servant of Jesus, you lose the fear of losing the things of this world….because you already gave them up. Very rarely does God tell you to do something specific like “go to Aftica.” Most of the time He wants you to use your freedom to choose to use your talents, gifts and abilities to benefit others and His Kingdom, which then builds up treasures in heaven for you to enjoy for eternity! 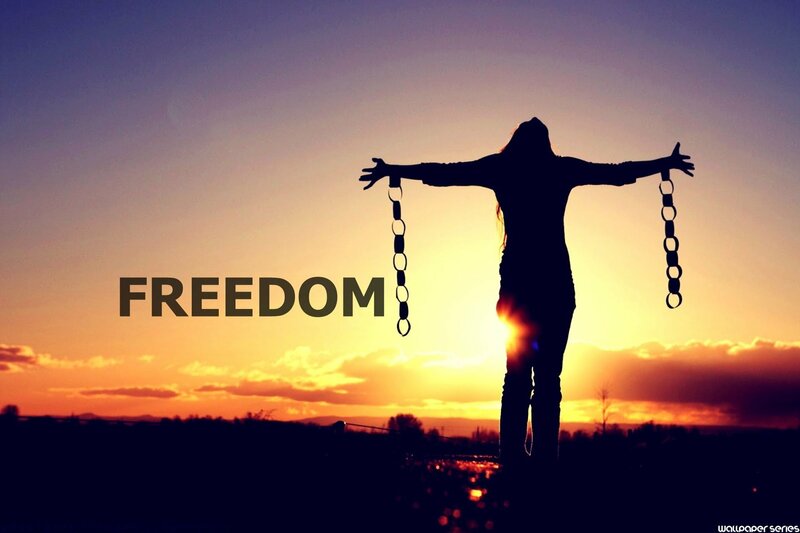 Using your freedom in Christ without the fear of losing the things of this world will enable you to take huge calculated risks, it will enable you to make huge mistakes and learn from them, and it will enable you to live out your purpose and be true to yourself. It all starts with giving up the right to the things of this world. Freedom always feels like loss in the beginning, and only the brave are able to achieve it.